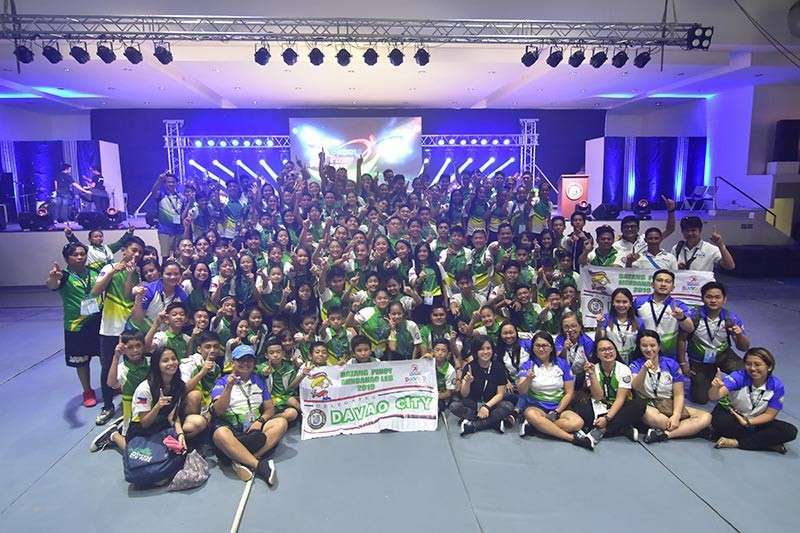 TAGUM CITY -- In a last ditch of effort, the sepak takraw and badminton teams delivered one gold medal apiece for back-to-back overall champion Davao City in the Batang Pinoy 2019 Mindanao Qualifying Leg that formally closed late Saturday afternoon, February 9, at the RDR Gym, Davao del Norte Sports and Tourism Complex here. Thus, raising Davao City's total to 58 golds, 40 silvers and 58 bronzes to retain the overall championship of the weeklong sportsfest organized by the Philippine Sports Commission (PSC) and supported by the Provincial Government of Davao del Norte, Pagcor, Department of Education and Department of Interior and Local Goverment (DILG). The pair of Harlene Claire Herbabuena and Janinah Jaron Panisales combined forces to nail the badminton girls under-13 doubles gold after beating Cagayan de Oro City in the finals at RDR Gym. Panisales also pocketed a bronze in the girls singles U13 event. Maria Francheska Denise Almazan and Khea Montanez also settled for a bronze in 15-under girls doubles. At the University of Southeastern Philippines (Usep) Gym, Dabawenyos Stephen Dave A. Kilayco, Justine Keth L. Celerinos and Michael John A. Acelo survived past Pagadian City, 2-1, in the boys sepak takraw doubles championship game. The Davao team was coached by Ruel Yataza. 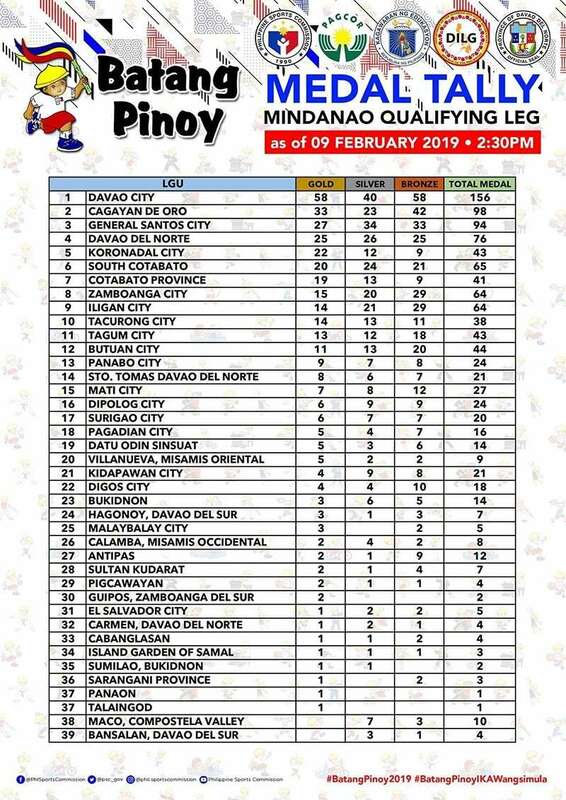 Cagayan de Oro City placed second with 33 golds, 23 silvers and 42 bronzes followed by General Santos City (27-34-33) third, Davao del Norte (25-26-25) fourth, Koronadal City (22-12-9) fifth, South Cotabato (20-24-21) sixth, Cotabato Province (19-13-9) seventh, Zamboanga City (15-20-29) eighth, Iligan City (14-21-29) ninth and Tacurong City (14-13-11) 10th. Sports Development Division of the City Mayor's Office (SDD-CMO) officer-in-charge Mikey Aportadera, in a media interview at the Batang Pinoy 2019 Mindanao Qualifying Leg media center, said, "I am very much thankful of the performance of athletes. They improved. This is a testament to their commitment to their sports and the support of their families, coaches and trainors." He said winning the Batang Pinoy Mindanao overall title for the second time in a row, the first in Oroquieta City last year, was a big deal for the city. The swimming team, which collected 17 golds, led the city's medal haul followed by arnis and karatedo with seven golds each, athletics with six golds, archery with five golds, futsal with four golds, taekwondo with three golds, tennis and chess with two golds each and one each from sepak takraw, badminton, basketball, dance sports and baseball. PSC Chairman William "Butch" Ramirez, during the closing ceremonies, said the Batang Pinoy, a centerpiece of the Sports for Peace program of the PSC, will remain. He also thanked Davao del Norte for its partnership as host of the Batang Pinoy 2019 Mindanao Qualifying Leg and other PSC endeavors with Department of Education (Deped).